Spaghetti Alla Carbonara was one of my favorite dishes to eat while I lived in Rome for a semester. A definite comfort food, this dish is easy to make and packs a lot of flavor. I made this for the family during our trip to Wisconsin and everyone seemed to really enjoy it. The recipe below is slightly adapted from the Food Network's Tyler Florence. On a side note, I realize that I have not posted many healthy recipes here... I think it is fair to say that comfort food reigns supreme over here at No Place Lyke Home. My brother-in-law and I joked during Thanksgiving that if we opened a restaurant we would name it, "Sh*t Slathered in Butter". Sounds delish, right? An homage to Paula Deen. Meanwhile, heat the olive oil in a deep skillet over medium flame. Add the pancetta (or bacon) and saute for about 3 minutes, until the bacon is crisp and the fat is rendered. Toss the garlic into the fat and saute for less than 1 minute to soften. Add the hot, drained spaghetti to the pan and toss for 2 minutes to coat the strands in the bacon fat (very healthy ;)). Beat the eggs and Parmesan together in a mixing bowl, stirring well to prevent lumps. Remove the pan from the heat and pour the egg/cheese mixture into the pasta, whisking quickly until the eggs thicken, but do not scramble (this is done off the heat to ensure this does not happen.) Thin out the sauce with a bit of the reserved pasta water, until it reaches desired consistency. 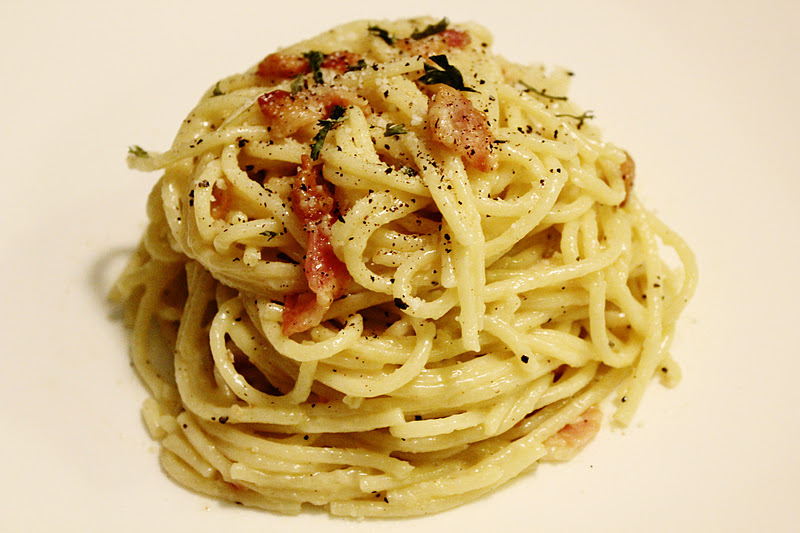 Season the carbonara with several turns of freshly ground black pepper and taste for salt. Mound the spaghetti carbonara into warm serving bowls and garnish with chopped parsley. Pass more cheese around the table. This is one of my ultimate comfort foods. YUM. I am going to have to try your recipe. And blog posts about healthy food is over-rated. I want to daydream about all the butter. this is one of my altime favorite last minute recipes! so stinking good!! !